I don’t know what’s up with me these days. I keep getting inspired on Facebook. Which is unfortunate. Why unfortunate? Well, most simply because I try not to be on it too much. And finding inspiration on it kinda gives me a somewhat legitimate reason to let my self-discipline go astray. And it’s already hard enough to muster in the first place. You see, a few months back, I deactivated my account for over a month. And surprise, surprise – I lived! I lived fine. I look back at it as a time of Facebook detox. A time of life away from the projected lives of others. A time that belonged to me and the persons around me – physically around me. And it felt great. I’d want to do it again. But my interests have currently re-aligned with being on Facebook, so I don’t think it’s going to happen. Too bad. I’ve started rambling again. (See how badly disciplined my self is?) Let me get back to my point. Yes. I got inspired. Well, not so much inspired as reminded. The other day, a Bertrand Russell quote inspired my ‘political’ post. Have you read it? People seem to like it, for which I’m glad, really glad. 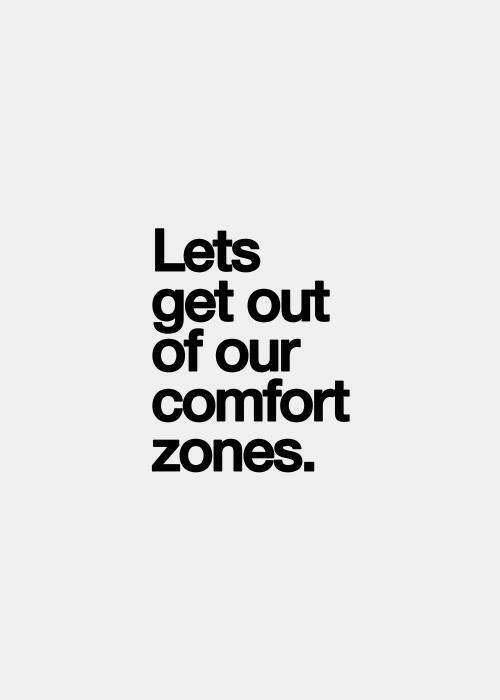 And some days ago, I saw this on Facebook: “Let’s get out of our comfort zones”. Nothing spectacular, I know. But it struck me. I’ve never really got out of my comfort zones. Now, what does this say about me? a) I’m inert (I may want to do things that take me out of my comfort zones, but end up not doing them due to inertia). b) I’m not that ambitious. d) I have large comfort zones. I can probably come up with more. So can you. Actually, your list is bound to look at least slightly different from mine, humans being different and all that. But, in my case, I think it’s a combination of c) and d). I’ve never really found many things difficult. In fact, I can’t recall anything I’ve done that was really hard – save perhaps the second-year Microeconomics module at university. I’m not challenged academically or professionally. I’d like to think I’m not challenged mentally. I’m a bit challenged psychologically, but I’d like to think it’s a challenge I’ve overcome over the past year (more on this later – actually, I can tell you exactly when you’ll hear more on this: 31.12.13). So that leaves a), b), and c). If you ask my friends, they’d probably tell you I’m this annoying active person who’s never content with sitting on her buttocks, which rules a) out. And as for b), I can rule that out myself. I’m fiercely ambitious, though I rarely admit it. So that leaves c). Am I scared? Oh yes. Oh yes I am. Scared of what? Of many things, but mostly change. I’m scared of change. It took me years to acknowledge and months to admit, to the detriment and dismay of many, including myself. What do I mean by scared of change? I’m the kind of person – I think – who expects things to freeze in time. Who goes away for six years to study and comes back home expecting my parents not to have aged, my life not to have changed, my friends not to have found other friends they (may or may not) prefer to me. You know. The kind of person who’s always clinging to the past. And my longing for the past generates a fear, a fear that the present will not match my expectations, informed by past events. And of course, the present never matches the past. The world isn’t made of wooden puppets and plastic trees. And this discrepancy scares me. It scares me witless. That is, until I realised how scared I was, and of what I was scared; at which point I began trying to form a more realistic perception of the world, of what it expects of me, and of what I can expect of it. The sort of perception that changes with the times. And that allows me to adapt to the ever-changing world I find myself within. Am I still scared? Yes I am. But not so much as before. I think. I’m less scared of change now. And I guess that’s one reason why I’m sat here writing this blog. I take great pride in my writing. The first time I showed my writing to someone ever was less than a month ago. And I was so scared of what they’d say that my hands were shaking as I pressed ‘send’. But I lived. And here I am. So I guess my point is: I’d like to think I’m breaking out of my comfort writer zone by writing this blog. By submitting my writings freely to your consideration. By exposing my strengths and weaknesses as a writer. By making myself as a person vulnerable to your judgements. Am I still scared that the blog will be a failure? That no one will read it? I guess that deep down I am. Well, actually not very deep down, or else I wouldn’t be making an effort to keep it running smoothly. But the fear is manageable. It’s fine. I love writing, but I can’t force anyone to love reading it. I can only hope. And hope is in this case enough to keep me going for the long foreseeable future. There are many other comfort zones I’d like to break out of. Become a singer, for one. Oh no. Don’t laugh. Still laughing? Yes. It’s my childhood dream that spilled over into adulthood. Am I in adulthood? (Not too sure there, really not too sure.) Well. Nothing wrong with never growing up, as the wise Avril Lavigne once sang. How about you? How large are your comfort zones? Are you ready to break out of them? Do share your thoughts. If you prefer the privacy of the inbox, you will find a contact form at the end of this post.